In our last lesson, we saw how to use the modal verb MUST in English. Sometimes HAVE TO is used instead of MUST. I have to write a letter to John. 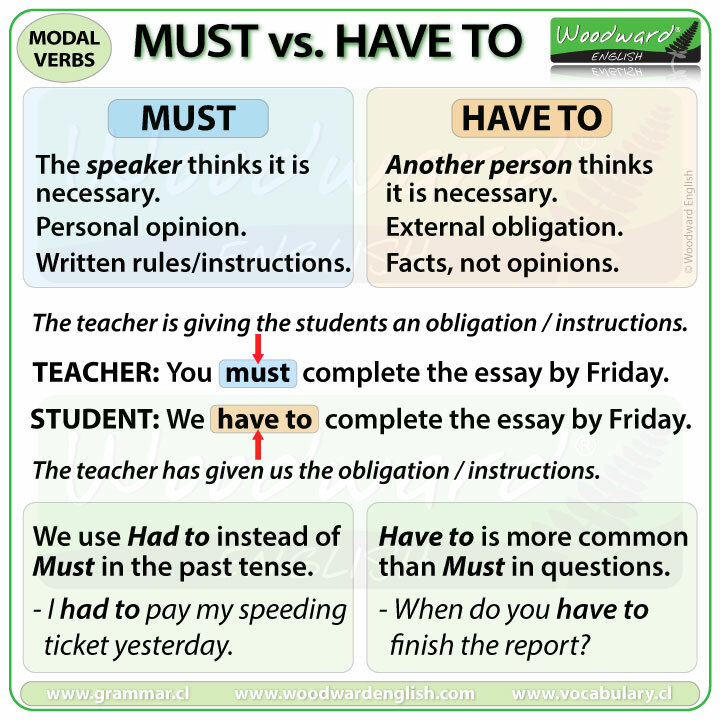 What is the difference between MUST and HAVE TO? MUST and HAVE TO are both used to express an obligation, responsibility or necessity. While Must can generally be replaced by Have to in the present tense, there is sometimes a slight difference in meaning or use. I must write a letter to John. We generally use must when the speaker decides that something is necessary, or needs to be done. In this case I have decided that I need to write a letter to John. Nobody else has told me to write it. I think it is necessary. The other example with HAVE TO. We use have to when somebody else other than the speaker has made the decision. So here, I didn’t decide to write a letter. Somebody else has told me to write it, somebody else told me it was necessary to do. I must book a hotel for my trip next week. Here I am reminding myself that it is necessary to do. I have decided that it is necessary. Our boss makes us wear a uniform. It is an obligation that our boss has decided that is necessary. I, the speaker, am not making this obligation, someone else is. The Student says: We have to complete the essay by Friday. The teacher has used MUST because he or has is giving the students an obligation. Since the teacher has given us the obligation, we use have to. This is because somebody else, in this case the teacher, has told us what needs to be done. When we mention someone else’s obligation, then we use the correct conjugation of Have to. Mike can’t come because he has to work tomorrow. It is Mike’s obligation to fulfill his work commitments. Susan and Steve have to pay their rent every Friday. They both have the obligation to pay their rent on that day. In both examples you would not use MUST because we are talking about someone else’s obligations. Questions – Must or Have to? When do you have to finish the report? Normally, you will not hear someone say “When must you finish the report?” as it doesn’t sound natural. Note however that you may still hear MUST used in questions, though mainly in British English. Must is only used in the present tense and sometimes to express the future. We use a form of have to for the other tenses. I had to pay my speeding ticket yesterday. She had to give a presentation to her boss. I will have to leave work early tomorrow. However, sometimes Must is also used to express future obligation. Though the version with will have to is much more common. In informal English, have got to is sometimes used instead of have to. Note that the subject and have/has are almost always contracted before got to in spoken English. I’ve got to … is a contraction of… I have got to … which is the same as … I have to. He’s got to … is a contraction of… He has got to … which is the same as … He has to. I’ve got to tidy my room before I can go out. I have got to tidy my room before I can go out. I have to tidy my room before I can go out. I’ve got to wash the dishes. However, when an adverb of frequency is used, have to used instead of have got to. In general, Have to is more frequent in conversation (or spoken English) than Must. Must is used more in formal writing, especially in written notices, rules or instructions.